While working on the NVIDIA DxgDdiEscape Handler exploit, it became obvious that The GDI primitives approach discussed the last couple of years would be of no help to reliably exploit this vulnerability. So we came up with another solution: We could map some specially chosen virtual addresses, forcing their paging entries to be aligned just right, and use the vulnerability to write those paging entries. In short, that would allow us to map an arbitrary physical address on our own chosen/known virtual address. In the next sections, we will cover details around x64 paging tables and the specific techniques used to exploit this vulnerability. X64 paging uses 4 levels of tables to map a physical page to a virtual page. They are PML4 (aka PXE), PDPT, PD and PT. Control Register CR3 contains the (physical) base address of the PML4 table for the current process. The 12 least significant bits of the virtual address is the page offset, the next 9 bits are PT index, the next 9 bits are PD index, the next 9 bits are PDPT index and the next 9 bits PML4 index. For our example (VA: 0x71000000000) we got PML4_index=0x0E, PDPT_index=0x40, PD_index=0, PT_index=0, Offset=0. Finally, all that's left is to multiply this PFN (0x3d7d9) by page size (0x1000), and add our page_offset (0x000) to the previous multiplication (0x3d7d9000). So we now know that our Virtual Address 0x71000000000 is actually mapping Physical Address 0x3d7d9000. First reported by Google Project Zero. There were a bunch of vulnerabilities in various PDXGKDDI_ESCAPE callbacks. 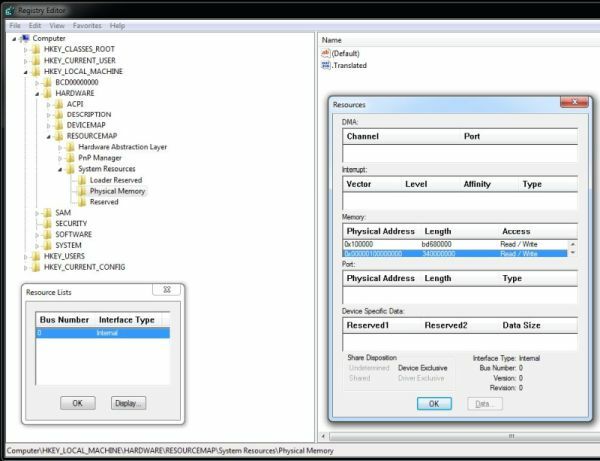 This is an interface for the sharing of data between the user-mode display driver and the display miniport driver. After some research we decided to focus on the ‘NVIDIA: Unchecked write to user provided pointer in escape 0x600000D’, a vulnerability that gave us the ability to write at an arbitrary virtual address, but with no control over of the data being written or the size of the data. 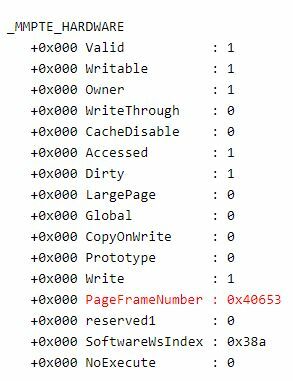 In fact, most of the data being written are zeroes, and the code forces a size check that only allows us to write a minimum of 0x1000 (4096) bytes. The lack of control over the data being written or its size forced us to discard the GDI primitives we've been using lately, so we figured we would need to do something different. A solution emerged (on Windows builds earlier than Anniversary Edition), by abusing the fact that paging tables discussed in “How Paging in x64 works” ALSO reside in a region of Virtual Memory sometimes called "PTE Space". PTE Space is a region of virtual memory the Windows Kernel uses when it needs to manage the paging structures. (touching page access rights, moving stuff to pagefile, working with memory mapped files, etc). By some bitshifting and masking, we are able to calculate the virtual address (on PTE Space) of each of the tables for any given Virtual Address. - Vulnerability allows us to write a bunch of zeroes to an arbitrary virtual address. - Paging entries in PTE Space can be written by the vulnerability. - Tampering with a paging entry's PFN could allow us to map any physical address. We could use VirtualAlloc, get a chosen VA mapped (ie: 0x71000000000, call it ADDR1a), and smash it's PD entry in PTE Space (ie: FFFFF6FB41C40000) to make its PFN point to physical address zero. Do it again for another address (ie: 0x71080000000, call it ADDR2a), we mash it's PT entry this time (ie: FFFFF68388400000) and make that point to physical address zero. At this point, our primitive is setup and ready. We can start making use of it by writing something that looks like a valid _MMPTE at address 0x71080000000. And then reading from/writing to virtual address 0x71000000000. Here are some macros to do that. We're using physical address zero because our vulnerability only allows us to write zeroes. But why does it work? If physical address zero was invalid our attempts would BSOD instantly. Well... we're in luck since physical address zero contains the Interrupt Vector Table (IVT) used by real mode, and (in our tests) seems to always be a valid physical address. 1) Preserving the _MMPTE flags. We need to preserve at least 3 of the 12 bits of flags intact to be able to read/write our spuriously mapped page from ring3. we need to make sure FFFFF6FB41C41001 is also a valid address. We can solve this by using VirtualAlloc again, but this time mapping 0x71040000000 (ADDR1b). Doing GetPDEVirtualAddress(0x71040000000) gives us FFFFF6FB41C41000, so now we solved the second problem. 3) This is a little more complex and hardware/os dependent. Paging structures are cached in the TLB (Translation Lookaside Buffer) for performance reasons. After using our mapping primitive we need a way to invalidate or flush the TLB, or else the changes made to the paging tables are not going to be immediately propagated (since the old values are cached). The way we try to force Windows to trigger a TLB flush seems to be very hardware dependent. 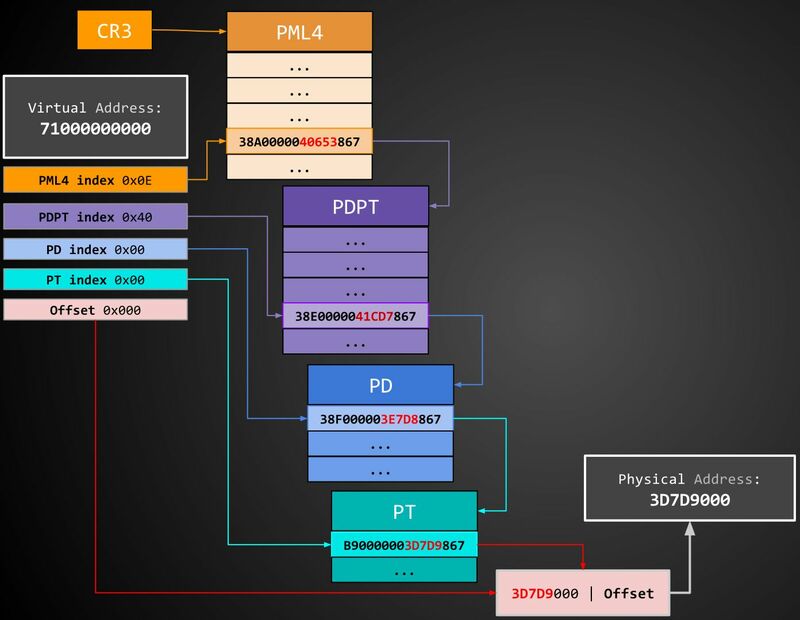 On some processors, a page fault could be enough to force a TLB flush, on others a task switch (CR3 reload) is required, and in some cases, even that isn't enough and may require an IPI (Inter-Processor Interrupt). The way I solved this (though not 100% reliable) is to try all of the above. 4) We are required to know the actual physical address of the PML4 table (the value of CR3) otherwise it would not be possible to remap a target virtual address to the one under our control. Let's say we know there's certain interesting value at Virtual Address 0xFFFFF900C1F88000 that we want to write. We would need to walk the paging tables, PML4-->PDPT-->PD-->PT-->[physical address], then write a valid _MMPTE with that physical address to ADDR2a (ie: 0x71080000000). So when we write to ADDR1a (ie: 0x71000000000) we would be writing the same physical memory as if we were writing to 0xFFFFF900C1F88000. To start walking the paging tables we are _required_ to know the physical address of PML4. On newer hardware, we could use Enrique Nissim's technique to guess our PML4 entry on latest Windows 10 editions. But, we'll focus on older hardware/windows versions (Windows 7/8/8.1 and 10 Gold) so we can solve this by using brute force. For simplicity, I'll assume the largest range in there is RAM (though this won't be the case 100% of the time). We can then try every physical page in that range until we find one with the correct PML4 self reference entry (at index 0x1ed). 5) We won't be able to walk EVERY paging entry to the point of recovering a final physical address. the real value of the PFN. Luckily this doesn't seem to affect our scan of the PML4 base. After successfully exploiting, if we were to terminate our exploit process the machine would BSOD. We could walk the PFN database looking for an MMPFN entry who's PteAddress matches our page entry address. to restore our entries back to normal behavior. entries by this technique alone. The way I solved this problem is by combining this technique with the one described in "Abusing GDI for ring0 exploit primitives". Use the Paging table primitives to corrupt a bitmap, and from that use the GDI primitives to restore our relevant mmPfnDatabase entries. and the added instability provided by the Windows Working Set trimmer trying to do its regular job. We hope this technique, albeit incomplete and sort of already out of fashion, could still be of use to other exploit developers.